Intuitive Operation By 4.3″ Touch Panel – The CE Lite-50 features intuitive and easy to use option by including a 4.3″ touch panel. USB Offline Operation – By using cut data saved in the USB memory you can easily cut without using a PC attached. 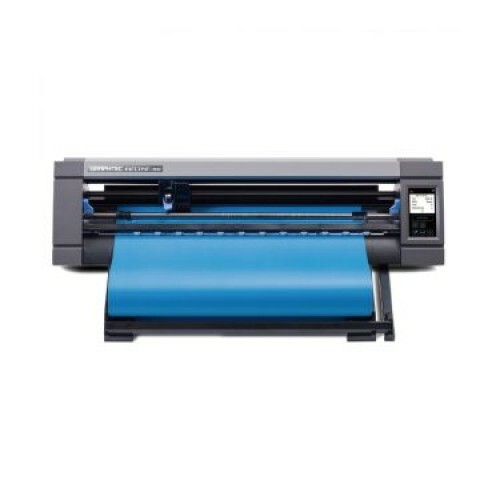 High Productivity For Business Use – With a maximum mountable media width of 508mm (20″) the CE LIte-50 efficiently produces art for your business. Supports Sheet & Roll Type Media – Continuously cut rolled media designs up to 3m long using the included roll media feeder with a guaranteed cut accuracy of 1m. 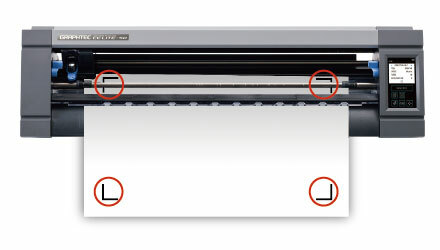 ARMS Print & Cut – Using ARMS Print & Cut, the plotter detects registration marks on the media to accurately align the position of the cutting line to the printed image. ARMS7.0 is able to detect marks on a media with various color surface. Simple Print & Cut – When using sheets, the CE LITE-50 finds the edge of the media and aligns the position of the contour cut line to the printed image without registration marks. 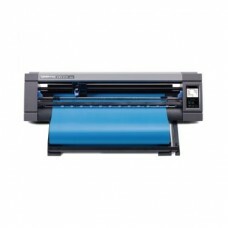 (Must use a standard size) The maximum cutting area can be utilized regardless of color or shading of media because registration marks do not need to be printed.